Did you know that Downtown Tempe Authority works with all of our stakeholders to have a positive impact on the homeless individuals that reside in Downtown Tempe? It’s true! In fact, we have raised $85,418.81 to date. However, our work is not complete. Our goal is to raise $100,000 which will be directed to our partnering social service agencies that aid those in need in Downtown Tempe. In an effort to reach our goal we are teaming up with Tempe Community Action Agency to host a food drive (fill-a-truck style) on Thursday, August 23, 2018. Donation trucks will be placed at Hayden Ferry Lakeside and Centerpoint Plaza. 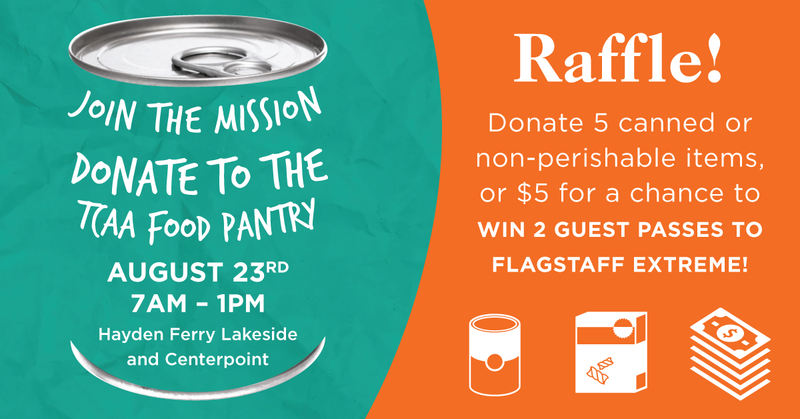 But wait, there’s more… when you donate 5 non-perishable items or $5 you will be automatically entered into a drawing to win 2 free Flagstaff Extreme Adventure Course & Adventure Zips passes. Come out during your lunch break and make a contribution that will make a difference in our community. 100% of all donations collected will benefit one of our good partners, TCAA. For 52 years, Tempe Community Action Agency (TCAA) has remained true to its mission and its overarching focus on hunger and homelessness. TCAA’s mission is to foster dignity and self-reliance for the economically vulnerable in the communities its serves. This mission is carried out through five areas of focus: homelessness and housing security; hunger relief; senior independence; and family health and economic advancement. TCAA is unique in that it is the largest nonprofit agency in the City of Tempe and operates Tempe’s sole emergency shelter and Community Action Program, the city’s largest Food Pantry, senior independence programs, family-focused workforce development program, and the largest home-delivered meal program. Operating from four locations in Tempe and South Scottsdale, TCAA serves residents across the East Valley. TCAA programs benefited over 22,000 unduplicated adults and children in FY2018--a 29% increase over the volume served in FY2017 and equivalent to one in eight Tempe residents. 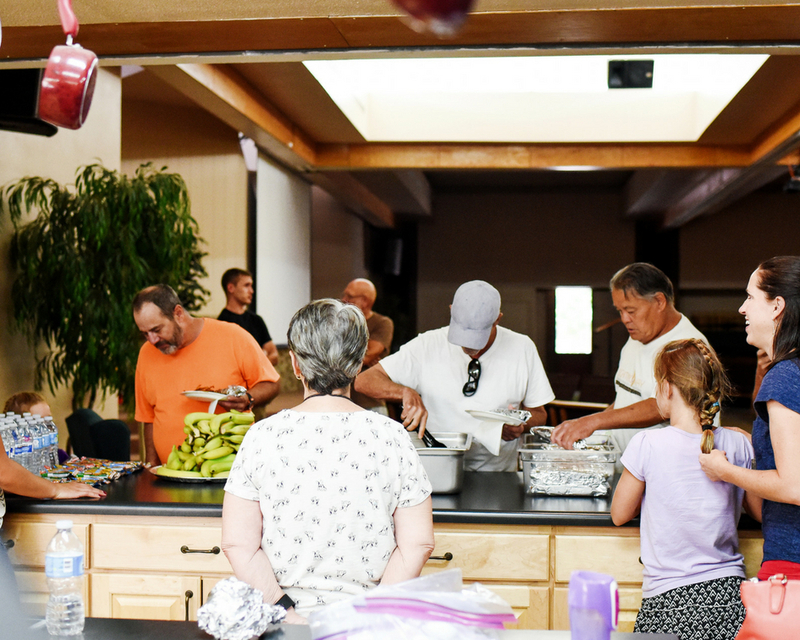 85% of the food that TCAA’s Food Pantry program receives comes from donations from local food banks, partnering restaurants and community food drives facilitated by corporate, civic and volunteer services groups as well as caring and compassionate individuals throughout the community. 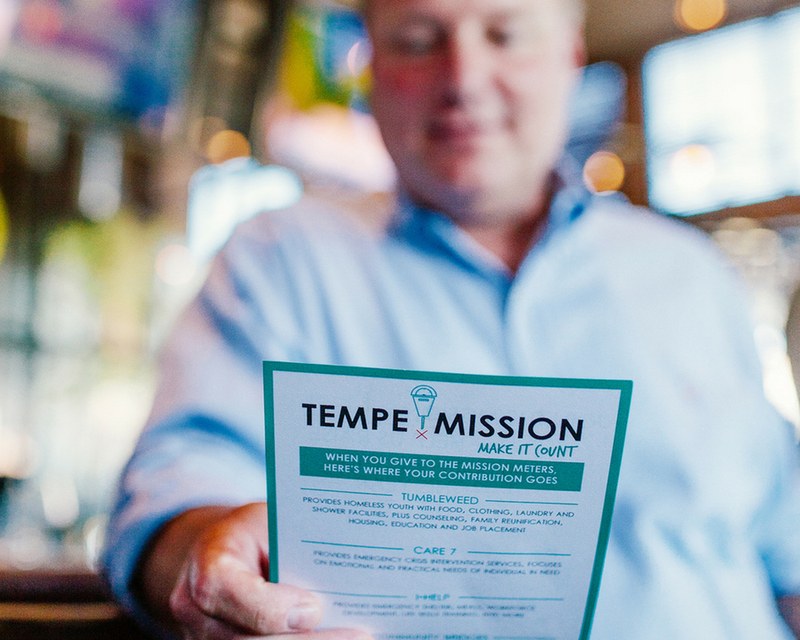 With your help, we can fight homelessness in Downtown Tempe. So...can we count on you to join the mission? Want to learn more about the Mission Campaign? Click HERE.